Think you don’t have the time to take on all the upkeep, maintenance and care beautiful roses require? We have a fabulous solution and it’s a knock out, a Knock Out® rose that is. This shrub rose is the single greatest sensation to hit the plant market in years! Knock Out® roses are valued for their continued and profuse blooming with very little care. Not only are Knock Out® roses gorgeous and easy to care for but they are also drought tolerant, self-cleaning, and disease and pest resistant. Knock Out® roses are like no other rose on the market. Planting your Knock Out® in the right location will help it flourish its very best. Knock Out® roses grow to about 5’ tall x 5’ wide. Give them enough space to grow to full maturity without overcrowding that can dampen their brilliance. Choose a planting location in full sun and with good air circulation to ensure the brightest blooms and best health. Planting soil should be amended with compost and drain well. Prepping the soil before planting will ensure proper nutrition for your rose. Soil pH should be slightly acidic, 6.0-6.5, but this plant will also thrive in slightly alkaline soils, with a pH as high as 7.5. Give your Knock Out® the best advantages as it gets established by planting it properly. Dig a hole twice as wide as the pot but no deeper than the containerized root ball. Remove your Knock Out® rose from the container, massaging the container slightly to loosen the root ball and exerting gentle pressure on the stems, not the foliage. Gently tease the root from the root ball to loosen roots so they will settle in to new soil more comfortably. Place the plant in the hole, making sure that it is planted no deeper that it was in the container. Backfill with amended soil and lightly press down around the plant to remove any large air spaces. Mulch around your Knock Out® to keep weeds down and conserve soil moisture. Water regularly until the plant is established. Knock Out® roses require much less extensive care than many other rose varieties, but some TLC will help keep your roses healthy and vibrant. 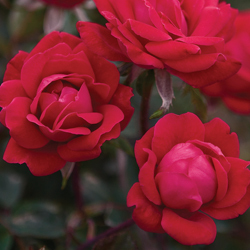 Once a year, apply about 2 inches of compost around the base of your Knock Out® rose. This helps replenish the soil’s nutrition for good growth and bright blooms. Mulch yearly with 2-3 inches of mulch to conserve soil moisture and prevent weeds. 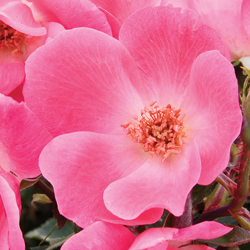 Fertilize your Knock Out® rose three times a year: early spring, early summer and fall. 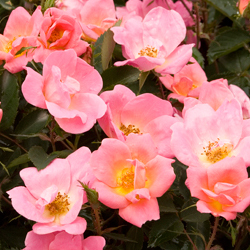 Fertilize with a slow-release product recommended for roses, and follow application instructions carefully. At the same time that you fertilize, also broadcast one cup of Epsom salts, a source of magnesium, on the soil around the base of the plant. Correctively prune Knock Out® roses any time of the year with hand pruners. Make your cuts about 1/4 of an inch above a leaf. Use sharp, clean tools to avoid transmitting pests or diseases from other plants. In early spring, each year, heavy pruning is recommended. Cut back the main stems to 1/3 of their height. Make your cuts 1/4 of an inch above an outward-facing bud for the best growth and shape. Which Knock Out® is right for your yard? Any of these varieties is sure to be a hit! Knock Out®: The original. Cherry red, single flowers. Double Knock Out®: Twice as much fun with cherry red, double flowers. Pink Knock Out®: Bright pink, single flowers. Rainbow Knock Out®: Single flowers in coral-pink with yellow centers. Blushing Knock Out®: Gentle beauty with pale pink, single flowers. 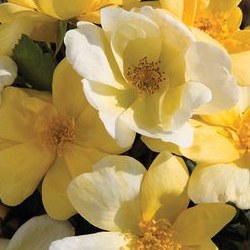 Sunny Knock Out®: A splash of brightness with fragrant yellow, single flowers.